At the beginning of each school year I like to get my advanced students "warmed up" with some drawing studies that hopefully knock out a few summer cobwebs. I like to alternate subject matter from year to year and require my students to start with simple compositions and photorealistic drawings. They then get more innovative as they complete three separate studies of the same subject. 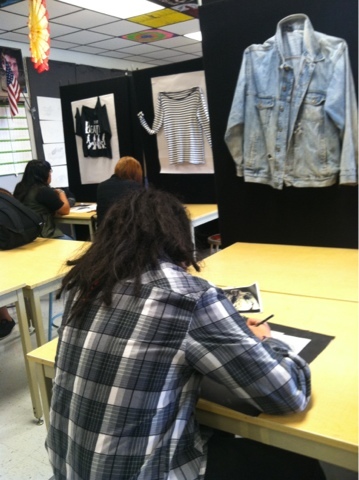 This year, my Art 3 and 4 students are using shirts as their subjects. 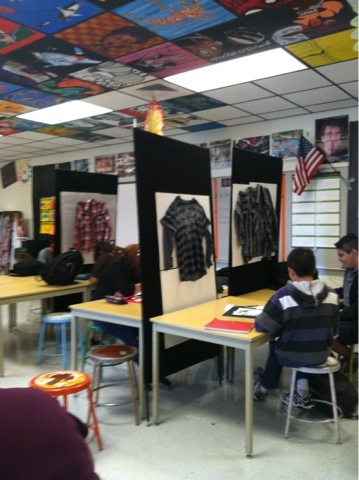 We are pinning their shirts on my display panels and also using photo references to create their work. I believe the most important skill I can emphasize with my advanced students is learning to work from direct observation. 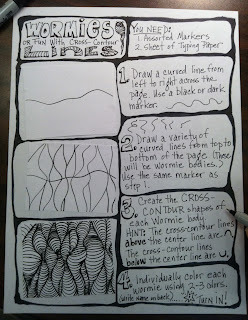 So many of my students want the ease of working from photo resources but direct observation artwork is always superior. I am blessed to have a large classroom to accommodate these big panels in use and then stored during the school day. 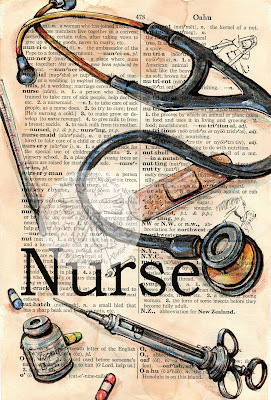 It is thrilling to have students who can draw this well. 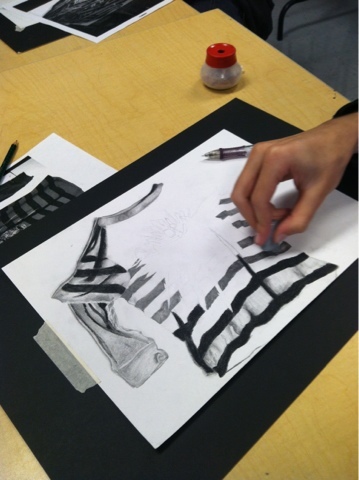 This student is a senior and he has excellent pencil skills. 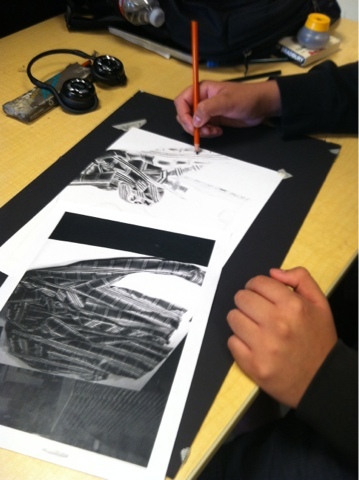 Each student had to pin their shirt and take a series of digital photos using a well-placed light source. 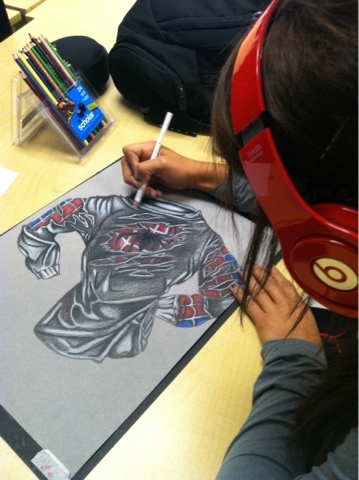 This senior wanted to start with a more creative drawing and is using Prismacolor pencils as her media. She has invented the Spiderman characteristics seen through the ripped shirt. I'm noticing the headphones. Do your students come in with their own music source and headphones so they can get in the "zone"? I wish I had that opportunity for my elementary students. I would imagine they are much more focused on their work this way. Are your students wearing headphones because they come to class with their own music source? I would imagine this contributes to a very focused art session. Wow great first of the year progect for older kids- I did self portraits with my K-6 kids and it was fun to be back! My administration lets me sell music permits to my students as a fundraiser. My student pay for the privilege of using their electronics and ear buds or cell phones in class when I am not lecturing/demonstrating or giving a test. If they violate the rules of the permit they are lose their permits.